Logica Yachts has outlined plans for major expansion as it takes over a new facility in Viareggio, Italy. 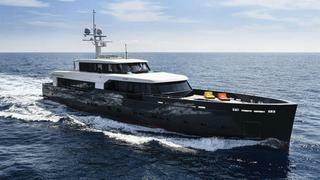 The Italian shipyard delivered the 45 metre superyacht Logica in 2014. The builder’s new site will house a modern production facility and offices situated in the very heart of the Italian superyacht manufacture in Viareggio. The company is owned by a major international holding and the purchase of the new yard is seen as a consolidation of the shareholders’ investment in the business after the delivery of Logica last year. The superyacht was exhibited at the Monaco and Cannes boat shows in 2014. Read Boat International’s full review of the superyacht Logica 147 at the Monaco Yacht Show. The superyacht has naval architecture and interior styling by Luca Brenta and accommodates 12 guests in a master, a VIP, two double and two twin cabins, with pullmans for two additional guests. Powered by MAN engines she has a cruising speed of 15 knots and can get to a top speed of 17.4 knots. Logica was launched in Italy last May, giving outline plans for a displacement superyacht in steel and aluminium, aiming to bring the world of luxury sail cruising to motor yachts. Logica is listed for sale – see specifications, details and photos. The new yard will accommodate boats up to 55 metres, and Logica Yachts plans to design new models that will be unveiled in the near future. The Italian company says that with the new set up, it is able to offer a new product range in line with renewed, demanding market requirements, as well as first class facilities to allow for the highest quality production.